Chief Police Officer Ray Johnson has concerns about pedestrian safety around the light rail corridor. Photos: George Tsotsos. ACT Policing is urging pedestrians to be more aware of their surroundings after officers witnessed 49 separate jaywalking incidents in an hour at the intersection of Northbourne Avenue and Alinga Street along the light rail corridor. Over a one hour period, high visibility patrols issued 58 cautions – 49 to pedestrians who did not comply with pedestrian crossing lights, seven cyclists not wearing helmets and two cyclists going through red lights. 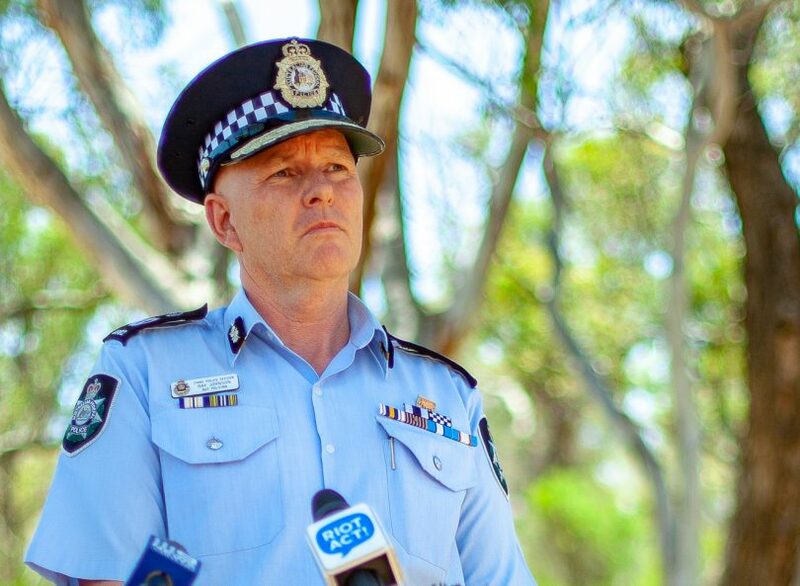 Chief Police Officer Ray Johnson said the intersection of Northbourne Avenue and Alinga Street was selected as it is statistically the highest area for vehicle collisions with pedestrians in the ACT and labelled the pedestrian’s actions as “very dangerous and totally unnecessary”. Speaking to ABC Canberra this morning, CPO Johnson warned jaywalking across the light rail track could lead to fatal consequences. “Part of our concern as we prepare ourselves for the opening of the light rail, we had traffic members in uniform with reflective high visibility vests spend some time on an intersection along the light rail corridor over the last couple of weeks,” he said. “In an hour’s period, they identified 58 different breaches of road rules by pedestrians primarily. Two weeks ago, a man was taken to hospital after he was hit walking across the light rail network on a red signal and with headphones in and CPO Johnson warned against other pedestrians doing the same. “On the face of it, that might seem safe enough to cross but it’s not,” he said. “It does raise my concerns about pedestrians thinking about their own personal safety, particularly around light rail. “It is time to enforce the importance of careful, appropriate and legal pedestrian crossing on roads because the light rail will increase the danger of taking an extra step if they aren’t paying attention. “Historically, about 10 per cent of pedestrian incidents on the road occur on Northbourne Avenue, so it is already one of our higher touch points in term of pedestrian safety. 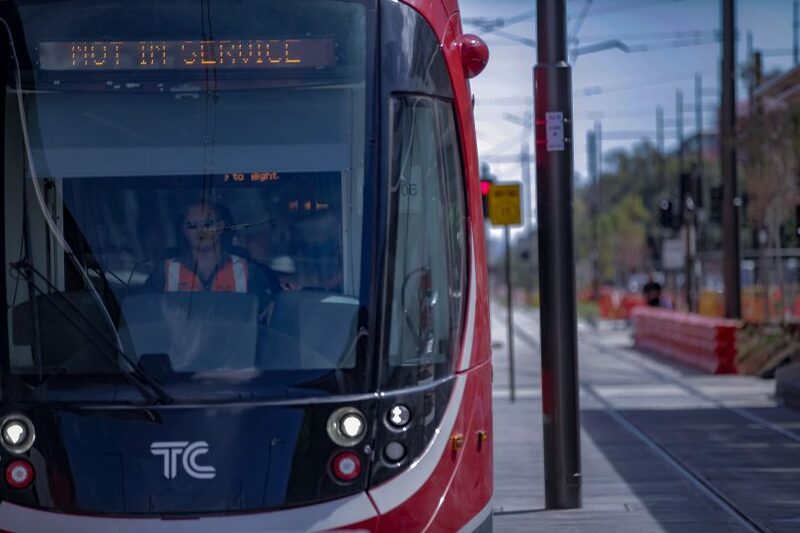 With the light rail network set to launch on 20 April, CPO Johnson reminded Canberrans it is an offence to enter a pedestrian crossing against a red light with a fine of $151 and urged pedestrians to show extra care. “I think the message in the early days of light rail is to pay double attention,” he said. “It brings another aspect into the driving and walking around Civic and Northbourne Avenue. It might be a good idea to get cyclists to dismount and walk their bikes across the tracks. It is easy to get wheels locked and jammed in the tracks. I already dismount and walk the bike when I’m crossing a road at lights. Enough is enough! I don't want to hear AnY mOrE about Chief Scumbag Barr's gosh darn newfangled train that nobody at my Tuggeranong retirement village will be using until our so-called "government" stops selling random blocks of land that I rarely if ever see to the big evil GEOCON who have the sheer nerve to purchase land that's for sale, and build modern homes for people and satisfy market demand! Once that's stopped, all ACT gov employees are on poverty wages to save me that 0.4% of my super I could be investing in a cruise, and that streetlight on the path behind my retirement village unit (that was no doubt broken by some no good hoodlum youths I've seen loitering) is FINALLY fixed so I can put my cat out safely, then I might consider voting for that lot again. For the law and the people indeed! Fortunately from the Melbourne tram experiment we have learned that humans will learn to survive and those who scrape themselves up from the remnants of the light rail hitting pedestrians destruction will erect large and beautiful monuments to those less fortunate. I don’t agree that they should have been only given a caution, they should have been hit with a ticket for breaking the law. Its time that police take responsibility for the laws they have been entrusted to protect and enforce and stop paying lip-service to the ones that are inconvenient to their run to the coffee shop to pick up more donuts. Just hand out a weekly darwin award to their next of kin so they are encouraged to push themselves to greater and more stupid attempts. First they came for the roads. But I was not a driver so I took no action. Oh dear! How horrific!! Never mind the speeders, the phone users, the tailgaters, the red light runners, the unregistered, the unlicensed nor the bikies shooting up the place, torching cars and bashings, the jaywalkers must answer for their crime. ACT “Policing” is a total farce. Darwinian Theory springs to mind!! Is it about time the ACT began looking at physically separating pedestrians from wheeled traffic? Subways and overhead bridges are just one method – for the pedestrians. But why not for the wheeled vehicles. Do we really need a 3 lane highway running through our civic centre. Road tunnel from Northbourne under the hill to Commonwealth Avenue anyone? Well the police were to busy fining people for not wearing helmets on the bike path the other day. People will no doubt die from stepping in front of the tram, it's thier own stupid fault but the police wasting time with cyclists while pedestrians are probably going to die shows how screwed up the police priorities are. Also the timing for pedestrian lights is a complete mess. It can take 40 mins to walk from the western side of northbound to braddon and back. Stefy Stef dun dun dunnn. This you, all 49 of them. Even if pedestrians obey the signals, Light Rail already has a record of running red lights. So we’re all at risk regardless. Maybe they should have thought about either 1. Underground rail system; or 2. Overhead walk bridge over Northbourne, hell....why not 3 or 4. Arggh but then there's potential danger!!!! Yeahhhh...Like there was NO danger by building this pain in the A light rail past 2 years. So everyone gets inconvenienced....we have someone hit already before opening...I hear a motorbike hit it as well?.....and a light rail driver has ALREADY gone through a red light, which could have collected the car! Now the CARS are at fault....and WE get fined....if we get in the way of the light rail? This has been BS from the start!!! Waste of money! Ruth Foley get over it. It’s called change. There is no progress without change. Maybe look left, right and left again before you cross? Did those cheapskates even CONSIDER building the entire city subterian? Hmmm, I have a funny feeling that buses and cars tend to exceed the top speed of the light rail train, so i'm not entirely sure why they're so concerned..... I'd be more concerned about roos going across the roads and tracks between Civic and Gungahlin. I don’t believe “Jaywalking” is a chargeable offence in the ACT.